and fuss free process. You responded promptly to my questions as well. I would like to send both of you many thanks for all you have done over the past few months. You did an excellent job from the home ready to put on the market and to closing of escrow. Special thanks to Lucy. As I am in Los Angeles and had to do this via long distance, I was a bit skeptical at the beginning but you made it easy for me. You kept me up with all the details and making sure all the paperwork is signed and done correctly. You both have been professional, helpful, and made this the best real estate experience I have ever had. I appreciate your efforts. Thanks again getting my sister’s estate in Waimea sold. The Job well done! I want to thank you both for the wonderful cookies from Big Island Candies, it is my favorite cookies from the Big Island. It was such a pleasure to work with both of you in selling my condo at Kanaloa. Peggy you are so professional with excellent ideas on things to do to make the unit more sell-able to the buyer and getting things done right away. Your thoughts and ideas were very helpful in getting the condo sold. Lucy you also helped in making sure I am kept up with all the details coming up on the closing process with a calendar of events coming up and making sure all the paperwork is signed and done in a proper manner. Working with both of you as a team made this real estate sale less stressful and successful. Peggy and her staff did an awesome job helping my sisters and I get our parents home ready to put on the market. Once the property was put on sale it sold right away and went through escrow quickly. I highly recommend Lava Rock Realty! I can enthusiastically recommend Lava Rock Realty for your real estate and property management needs. Peggy and staff are not only extremely knowledgeable, professional and detail focused, they are also dedicated to providing excellent customer service that goes way beyond the norm. They are among the best in the business that I have worked with over the years. I highly recommend Lava Rock Realty!! Peggy and Lucy are the best in assisting you with your real estate needs. They walked us thru the process with such ease and understanding of our needs. The process was a quick turn around with no issues because of their professionalism and knowledge of the best solutions. They assisted us above and beyond normal professionals in their field. If you are looking for a honest/friendly/hard working Realtor-Bev is the one. Bev would pick me up from work and drive me to different homes to peruse. Bev worked hard at finding the perfect home for me and my dog Angus. Bev made herself available 24/7 by text/email/phone. Bev was extremely knowledgeable about legalities and fine tuning contracts/revisions/negotiations-and fast! I was lucky to have her help with getting things done and fast. Bev was able to find contractors to get things done despite a holiday weekend. I would highly recommend getting Bev on your team for buying and or selling your home-if you are looking for an honest, and highly knowledgeable realtor that actually cares-then Bev is #1. Peggy did a wonderful job for us when we bought a condo in Hilo. We had to do the purchase long distance, and she was great about explaining the process of buying real estate in Hawaii, working with the seller’s agent to resolve issues, and helping us with some of the snags we encountered along the way. I highly recommend working with her. When we decided to move to the Big Island from Oahu, we were referred to Peggy Yuan from a family realtor. After speaking with Peggy she lined up several homes for us to look at in different parts of Pahoa and Keaau so we could get an understanding of “the Big Island way of life”; catchment, unpaved roads, spaghetti lots, etc. This mind opening experience helped us narrow down the type of neighborhood we wanted to live in, the requirements the home needed, and the budget that we wanted to stay in. Peggy did her research, lined up seven or so prospects, and spent a day with us walking the homes. Half way though the list we found our forever home. Not wanting to let anyone else look at it we asked Peggy to put in the offer. Thought the purchasing process, Peggy was very understanding and answered all our questions. We were able to call her day or night. Having the ability to review and sign documents digitally allowed us facilitate the process faster so we could move into our new home. Peggy and her team coordinated all inspections, termite treatments, and repairs. Peggy and her team will be our “Forever” real estate company. We used Lava Rock Realty to purchase our new home in Kona. Peggy and her team met or exceeded all of our expectations. Peggy is an outstanding Real-estate agent and agency owner. I have been working with Peggy for more than ten years. We bought and sold four together and there two more that I still own. There has never been a problem!! Peggy answers all of my questions. Makes sure all the i’s are dotted and the t’s crossed. She has shown me a wide variety of properties on different Islands. All I can say is I feel blessed to have Peggy as my Real-estate agent and I wouldn’t trust any other on these islands.. Thank you Peggy for all of your help and always looking out for me..
Peggy and her partner Kerrie are true professionals. I would highly recommend her real estate company. From the moment my wife and I met them, they were extremely hospitable and helpful in our search at our new island destiny. They were kind and generous with their time and very patient with us and finally with us in negotiations and final close especially that we were back in Texas. They were so helpful and professional all the way through the process. We placed our trust in them and to this day we remain friends. Highly recommended and they are very good in the big island and came highly appraised from a very good friend and realtor in Honolulu. Lava Rock realty is top notch and A + . Thank You Peggy, for being such a professional Realtor and friend. The sale of our property went so quickly and smoothly. I will recommend you and your Company to all of my friends in your area. From our first correspondence; Ms. Beverly Giza exceeded our expectations. We are writing to express our pleasure with real estate agent Ms. Beverly Giza, who represented us in our recent HOVE land sale. While on active duty; Air Force back in 1966 we purchased a lot in HOVE. Moved to and retired in North Carolina, U.S.A.
Finding a trustworthy person – well; we just put it in God’s hand….. He has always looked after us! Ms. Giza guided us through the entire process, from market analysis to finding a buyer and closing the deal. We credit Beverly with a smooth, stress-free property selling experience. Buying or selling property, we had such a pleasurable experience. Beverly Giza is savvy, personable and knows the market inside and out. We never could have gotten through this process without her. To reiterate, we are nothing but pleased with Ms. Beverly Giza and her expertise and we recommend her to everyone. THANK YOU Beverly! May God continue to bless you and your family! About a year and a half ago my wife and I decided to move to the Big Island from Oahu. We wanted to find a special property using a no pressure realtor. Fortunately we were introduced to Beverly Giza who was both patient and on top of things while we found our dream home . We found her to be very pleasant, extremely intelligent, and a great communicator. A prompt reply was always the case whenever we emailed or called. Once the property was found she kept us informed through the loan approval and all the way to the closing. She even checked with us after we took possession of the property to see if there was anything else we needed. I would highly recommend Beverly Giza of Lava Rock Realty to anyone doing real estate transactions on the Big Island. When I first visited Hawaii around 30 years ago, I bought a travel book that said “Hawaii is an IQ test, and if you get back on the plane to go home, you fail”, and this always seemed pretty accurate to me. But sadly, I had failed this IQ test dozens of times over the years before walking into the Lava Rock Realty offices one weekend and meeting Peggy. After discovering that Hapuna Beach was my favorite place to hang out on the island, she took me down to look at a condo on the first floor of a building in Puako…I loved it and we put an offer in but got outbid by somebody who paid cash. I was crushed. Undaunted, Peggy offered to write letters to owners in the building, telling them she had an interested buyer. As it happened somebody responded to her letter just before I was scheduled for my next visit and I snagged a top floor unit with an incredible ocean view before it ever had a chance to go on the market. Now thanks to Peggy and Kerrie’s efforts, my IQ has finally improved. I just wanted to say thank you to Peggy Yuan for all of her hard work, time and her many many efforts on helping me and my family sell of our family home in Waimea. Peggy was so knowledgeable about the area and was very efficient on getting the ball rolling on putting our property on the market. She was very responsive and energetic every time we spoke with each other. She was also so very patient with me and my family while she had to get all parties to sign at different times. 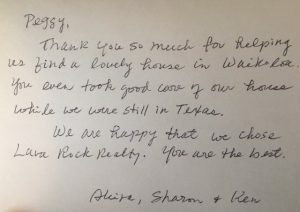 My family and I are truly pleased with the service and outcome from Peggy and the Lava Rock Realty staff. Thank you Peggy and we look forward to working with you again in the future! I will definitely tell everyone that you are the best on the Big Island! I left Hawaii many years ago and now live in New Jersey. Peggy Yuan assisted me in selling a parcel of land originally purchased in 1972 that I no longer wanted to keep. I was very pleased and satisfied with the way in which Peggy handled this long-distance transaction. She assessed the situation accurately and helped set a reasonable — and achievable — asking price. Everything went very smoothly – and more quickly than I had expected. Peggy was professional and a pleasure to work with. Mahalo to Peggy and the escrow team. It is a pleasure to say Mahalo for a job well done. There was so much to do to get this property ready for sale; not to mention seven sellers. Your patience and calmness was much appreciated. Your frequent communication with me and others involved with the sale was commendable. Without hesitation, I will recommend you to anyone looking for a place in “Paradise”. As you know, this property has been in our family for over a 100 years. It was definitely bittersweet. Earlier this year, my husband & I both retired. In order to transition to our new lives, big changes had to be made. One of which would be the sale of our Waikoloa Village condominium. During our working years, this unit was a convenient advantage in our daily commutes. Never having sold a home before, I turned to my friend & neighbor for advise. She had experience in this area. When asking her which real estate company I should enlist, without hesitation, she suggested Lava Rock Realty. So, I made a call, met with an agent, & thus began a relationship with a group of professionals that I now call friends. Lava Rock Realty helped us to determine exactly what we wanted going forward. All our questions & concerns were answered & we felt confident with the educated information that was given. We learned a lot, including that this company offered a team of experts, & each one of them were always available. The entire process went smoothly. Without a doubt, we would recommend Lava Rock Realty to anyone considering a real estate venture. Peggy & her reliable team are terrific. Peggy and Kerri wasted no time in finding me the right property that met all my needs. They were quick to respond to all my questions and willingly offered personal advice about the do’s and don’ts in living on the Big Island. I am extremely satisfied with my new home. A big mahalo to you both. This team rocked!FROM TEAM WORK TO GETTING IT DONE! RESOURCES, SUPPORT,COMMUNICATION,PERSEVERANCE.ENOUGH SAID. I just wanted to send a note to thank you and your fabulous team for helping us this past year to manage our investment property in Waikoloa Village. Julie and her team was wonderful to work with. They were extremely professional, on point and made it easy for us to rent our property. They were instrumental in finding excellent tenants and did so unbelievably quick. “Super” at behind the scenes administration such as: repairs in our unit, tax preparation and managing inbound rent income for us. We didn’t have to worry about anything with the Lava Rock team looking out for us. I would highly recommend anyone looking for a 5 star property management service. Look no further than Lava Rock Realty!! After several years of searching for the perfect manager for our vacation rental, a mutual friend recommended Kerrie. Our lives changed for the better that day and no longer do we think that vacation rentals are not for us. With Kerrie on board, we can relax knowing the house is in good hands. We have found Kerrie to be extremely responsible, diligent, and conscientious. Kerrie is always pleasant, easy to work with and maintains excellent communication. She is proactive to both problems which may arise and the needs of the house. Kerrie is truly a gem and we feel fortunate to have found her. We have been working with Lava Rock for several months now and the experience has been stellar. We have struggled to find a management company who fits our specific needs and Lava Rock has ticked every box. They are friendly, helpful and our guests love them. Our property has never been in better shape thanks to Lava Rock’s attention to detail. Mahalo to Tanya for introducing us to Kerrie and the amazing Lava Rock team! We had a terrific experience working with Tanya. Our land purchase was not a simple process and took many months longer than planned. Tanya worked hard to help us with our strategy and we feel like we were able to get the best deal possible. There were so many moving parts and unexpected things that needed to be addressed. Her ethics, experience and expertise were very much appreciated and valued in this transaction. I highly recommend her. You expect a good realtor to understand what it is you are looking for in a home, find properties that meet your criteria and organize the viewings in an efficient and professional manner. If, in addition to this, your realtor has the combination of skills and enthusiasm to make the experience stress free, enjoyable and successful then the whole process moves to the next level. Tanya achieved this high level and more. She has a wealth of knowledge on local facilities, contacts and essential services. When we found our new home she made the transaction as simple as possible at the same time helping to secure an acceptable price. Tanya and Peggy, you both are such gems in the real estate industry in Waimea. Your attention to details were priceless. You are both very professional, prompt and prepared for everything that came up. Both of you were very resourceful and helpful in fulfilling your duties as agents, even when you both were under the weather. Thank you for your tireless efforts and placing strong emphasis communicating and educating me when I didn’t understand some things. You guys are truly amazing! You are both the Rock in Lava Rock! We are happy to give you and Peggy, in your capacity as Lava Rock Realtors, a very big “well done” for the very professional, courteous, and friendly assistance to Shirley and I that you provided in all aspects of the sale of our Waikoloa condo. We are aware that the real estate market during the period our property was for sale, nearly one year, was not nearly as exciting as it has been in Hawaii previously, so you both had to expend a great deal of extra effort in finding a suitable buyer. Thank you so much for successfully guiding this sale through escrow!! Kerrie Mattis is our property manager for our condo at the Shores at Waikoloa. As a property manager it is important to have someone care for your “home-away-from-home” in the manner you would take care of your own. This is what Kerrie does! She makes certain our home is respected by our guests and taken good care of by all other specialists assisting with the maintenance. Kerrie’s incredible manner of customer service is the best! She is always there when our guests have questions! My husband, Larry, and I have know her since the 80’s and don’t know what we would do without her! Peggy is an amazing realtor on the Big Island. After moving here we spent a year waiting for the perfect house. Peggy always kept us up to date on the newest houses coming on the market. She always worked to make herself available as soon as possible to show houses. When the perfect house came on the market she was sure to help us finalize the offer that day. She gave us expert advice for every step of the way and always had a local company to recommend. We had the easiest closing I’ve ever had buying a house and we are so in love with our new home! 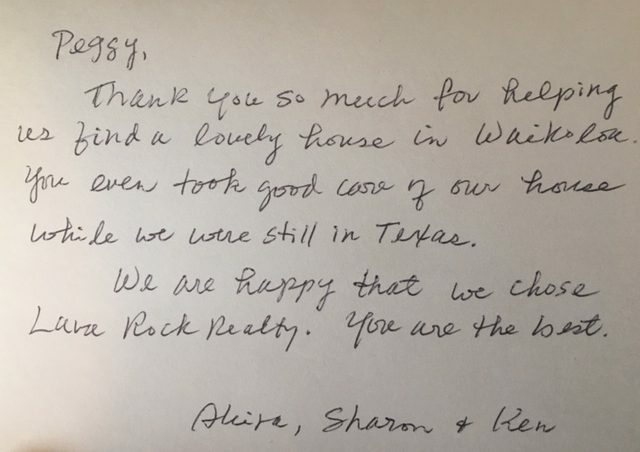 Peggy was the best realtor we’ve ever worked with. Always professional and willing to help. Thank you so much for helping us find our dream home! This was our eighth home purchase and by far the easiest – thanks to Tanya Klett. She was personable, professional, cheerful, and took very good care of us. We were always appraised of our options and once committed to buy, we knew what would happen and when. Tanya also thoughtfully provided us with contacts and information to facilitate our move. We had a very tight time frame and she even arranged for us to close in three weeks. Can’t say enough good things about Tanya! Plus, we like her. Full price offer, no contingencies, 30-day close sounds like the ideal real estate experience. It is unless the transaction has to deal with off-shore owners, a family trust, a 25-year old home that needed some TLC and some legal issues. It is precisely why we chose Tanya Klett as our agent. I would describe her as the “Diva of Details.” There were so many moving parts to closing this transaction and she did it with outstanding project management execution. We had a very tight timeline and a series of “must-dos” prior to close. Her ability to marshal vendors, contractors, horticulturists, Title Company and attorneys was outstanding. She gave a completely new meaning to the term “pro-active communication.” She told us what we needed to know before we needed to know it. Professional, pro-active, knowledgable, thorough and caring would best describe her style. We started this journey as client and agent. We ended as dear friends. They don’t get any better than Tanya Klett. Two words. Loved her! Tanya is a true GEM! She searched high and low for the perfect home for us and she found it! The purchase of this home had a lot of twists and turns and even ups and downs but Tanya always remained positive and figured out solutions to all the road blocks thrown in our way. We will definitely use Tanya again and would recommend her to anyone looking for their perfect home because of her amazing attitude and professionalism. We have had the great experience of working with Tanya Klett of Lava Rock Realty on the sale of our condo. Being off-island owners, she was the ideal realtor for us—easily reachable via phone and email, soothing when dealing with a difficult buyer, and keeping us informed throughout the process. Tanya clearly presented options to us and, in several instances, anticipated the twists and turns in the real estate dealings with the buyer. This was not a simple real estate transaction as we have experienced several times in the past. The fabulous photos used to market our condo were taken by her husband. Looking at those photo, I again fell in love with our own condo. My husband and I were impressed with her abilities and grateful Tanya was our realtor. We could not have asked for a better realtor to have walked the journey with us. Tanya Klett has been outstanding in her service selling my parents older home in Waikoloa Village. The extra work that needed to be done was promptly executed with no hassles. The staging of the house, the pictures that were taken were above and beyond any realator I have ever dealt with. Tanya is a worker! She knows how to sell a home. Thank you for a fantastic job. Thanks to Peggy’s professional and diligent assistance, I’m able to sell our house in three weeks. Although there were some delays in the process of escrow, my house was successfully closed today and yes, it’s bittersweet for me as it was our home in the past three years. However, I’m so glad that we found right people who cherish our lovely house now. Thank you, Peggy, welcome to Taiwan and hope we have chance to get together either in Taiwan or Hawaii in the near future. Thanks Peggy. You steered us through the process and your on-going communication as to status was outstanding. Both we as sellers and the buyer benefited from your service. If I know of anyone looking to sell or buy on the Big Island, I will certainly refer them to you. Thank you for sending the “Big Island Coffee Shortbread” cookies! That was very thoughtful of you! Also, I appreciate your patience and assistance in selling my lot. I will be out of town for a few days to enjoy the freedom of having that phase of my life completed. Due to the unfortunate death of a long-time tenant, I was faced with making a decision regarding the disposition of property on the big island. The house on the property was quite aged and in need of substantial upgrades as a prelude to being marketed for rental. As a resident of Honolulu, I did not know anyone or had any contact with real estate companies on the big island. I was referred by a friend to Lava Rock Realty and its principal, Peggy Yuan, in Kamuela. The total experience of working with Peggy and Beverly, was very fulfilling and gratifying for me. From our initial meeting to strategize rental vs. selling property, identification of required repairs and obtaining contractor bids, and the identification and disposal of military ordnance, Peggy and Melissa were very professional and efficient. They worked tirelessly prior to signing any contractual arrangement and never sought compensation for their efforts. I really appreciated their dedication, attitude and the manner in which they sought to serve a potential client. When we finally decided to sell the property, Beverly took firm control of the process and efficiently and professionally managed all phases and concerns from the initial pricing, contacting potential buyers, and paving the path through closing. She was in continuous contact with me and quickly moved to address and resolve any issues that surfaced. I was extremely pleased with the entire process and would not hesitate to recommend Lave Rock Realty to anyone seeking real estate services on the big island. A big “Mahalo” to Peggy and Beverly for all of the work and effort involved with the sale of my property. I highly recommend Peggy Yuan for your upcoming real estate transaction! After receiving 3 offers on my home, I had given up and was ready to place my home back on the rental market. Peggy and I agreed to give it one more week to find another buyer and she came through! Today, my home has been officially sold to a lovely couple who will take pride in the house for years to come! I couldn’t have asked for a better Realtor to sell my Waimea house! Peggy is thorough, very aware of the market and has a solid reputation with other Agents. MAHALO NUI LOA! It’s hard enough to sell a property when you live in the same city. Being a distant homeowner makes it even more difficult. However, Tanya Klett created the P.A.T.H. for our selling success. P= Professionalism. Tanya was knowledgeable about the process from A to Z. She kept us apprised of each step along the way. A=Attentive. She was very attuned to our needs, hopes and desires. We appreciated her opinions and perspectives but ALWAYS left the final decision in our hands. T=Thorough. She knew how to manage all the details in the right sequence. She “staged” our vacant space into a warm, inviting, tasteful home. She was the consummate professional when dealing with our contractor. She had that honed instinct of knowing when to push and when to let it be. H=Heartfelt. No matter what time of day we talked or emailed she treated us with kindness, respect and lead with her heart. She made us feel like we were her only clients. Our initial inquiring phone call turned into that rare “client into friend” encounter. If you want a great selling or buying experience, let Tanya Klett lead you down the P.A.T.H. of success. Peggy Yuan was highly recommended to us by my cousin, who use to live on the Big Island and we are so grateful. Peggy was very professional and efficient from the very start. Because we live in California, all communication was done by phone and email in a timely manner. We appreciated her expertise and honesty. We definitely would highly recommend Peggy to anyone in need of a real estate agent on the Big Island. We rocked with Peggy Yuan at Lava Rock Realty with our recent HPP lot sale on the Big Island. This is our second time working with Peggy. As usual, Peggy delivered superb professional services. She helped us price the lot right and offers came in within 48 hours. Also, she used electronic communication to conduct business and transmit documents for our signatures. We never had to go to her office. We really appreciated Peggy’s quick response to calls, timely delivery of business transactions, technical knowledge in real estate, and desire to meet customer satisfaction. Most importantly, Peggy is honest and have high standards of work ethic. We would highly recommend Peggy to relatives and friends. Peggy Yuan was recommended to us by our Honolulu-based realtor, and we could not have been more satisfied with her handling of our residential property sale. She was very knowledgeable, professional, responsive, and though she was very busy, made us feel as though we were her only client. As absentee owners, we were quite concerned about the maintenance of the property during the listing and aftermath of the hurricane. Peggy kept us well informed so we were able to make timely arrangements to keep the property in top shape at all times during the sale process. We are very grateful to her for providing us with such a positive experience in the sale of our Kamuela home. I live on Oahu with my family and take care of my aging father, who is in a retirement community. When I asked my Realtor, Cherie Tsukamoto, about selling several of my father’s Big Island properties, she recommended Peggy. Thus far, Peggy has successfully sold four of my father’s five properties. The process has been very smooth, convenient and effective. Because Peggy uses electronic methods to transmit documents, obtain signatures, and conduct business, I never had to set foot on the Big Island. The sales were all done professionally and with little effort on my part. Overall, I am very pleased with Peggy’s service and would not hesitate to use her again in the future. Previously, my only experience with a realtor as a seller did not go well at all. The communication between my realtor and I was horrible and it nearly cost us the sale of our house. The most important thing for me this time was that I wanted to make sure that the communication between us was clear and constant. During the entire process, I had more texts and emails from Tanya than everyone I know combined. The best part was, she was more interested and concerned about our life than she was about the sale of my house. She always treated me more like a close friend than a client. She also went way above the call of duty, by always trying to help us with anything and everything to make our move from Hawaii to the mainland smoother. But when it came to selling our home, she was all business. Never once did we feel like she didn’t have our back and she paid attention to the smallest of details. Tanya is by far the very best example of what a realtor should be. Even though she started out as our realtor, I truly feel I can call her my friend. Peggy helped me purchase my first home and did a great job. She answered all of my questions and helped me throughout the process. She even arranged for a contractor to come the same day to give a second opinion after the inspection. I would recommend Peggy and plan on using her in the future. I cannot begin to adequately express my deep appreciation and gratitude for all that you (Beverly Giza) did to help me through my recent house-selling process in Kohala Ranch. Your very high level of expertise, knowledge and professionalism were why I wanted to work with you, but I was also continually grateful for your warmth, heartfelt friendliness and true aloha spirit during those moments when I got discouraged. I am firmly convinced that I got the best representation from initial listing to final closing because you were my partner throughout. Thank you so very, very much for all the guidance and many little extras that you provided. Now that I’m almost settled on Maui, you are invited to my new home here anytime to a relaxed social call when scheduling permits. Thanks again, a hundredfold. I recently sold a property in Waikoloa Village on the Big Island of Hawaii. I had the distinct pleasure of having a truly superb real estate professional represent me in that sale from Lava Rock Realty. She was a delight to work with. She really listened to my needs, kept my confidence, and provided timely pragmatic advice and recommendations. She can be counted on to do what she says she is going to do. I have bought and sold many different kinds of property over the decades and I can honestly say that I have never dealt with a finer real estate professional. She is completely trustworthy and I recommend her unconditionally. You are fantastic! Thank you for making the process so easy and smooth. You were great at explaining things to me every step of the way and made the sale of my condo a success. Thank you for everything. You are good Realtor and thank you for everything. I will be in touch with you. See you soon. Lava Rock Realty took over as property manager for our home and quickly addressed all of our concerns. Lava Rock followed through on each of our requests, which were many, including contacting our termite tenting company, working with HELCO to trim branches away from the power line to our home, coordination with our lawn care company and maintenance person to address tenant needs. We appreciate all of their efforts to ensure our tenants are satisfied with the home and that it is kept in good condition. Lava Rock Realty rocks! Peggy did a great job helping me throughout the process of the sale of my house in Hawaii. The sale went smoothly and expeditiously. Their services were very professional and efficient. I had a very positive experience working with this team. I highly recommend Lava Rock Realty! Buying my property on the big Island was made fast and easy. After showing me the available properties that met my wish list, Peggy Yuan guided me through the buying process. She took the extra steps to help because I live off island. Peggy is friendly, helpful, and informed, I can’t ask for a better agent. No regrets, I would do it again. When we made the difficult decision to sell our condo in Waikoloa Village, we asked around for a good realtor. As residents of the mainland, we needed someone who would represent our interests by actively marketing our property, who would keep us informed and respond in a timely manner to our concerns. From friends whose property she had sold came the recommendation of Lava Rock Realty. We were impressed with their professionalism from the beginning. She knew the local property values, seemed well-connected in the real estate network and gave us sound advice about asking price, property presentation and the procedures for selling that were unique to the Islands. Even in a “slow market”, we ended up with 3 solid offers and sold our unit for asking price. We can’t thank them enough for making this transition easy and thorough. We recently purchased our brand new Luala’i home with Peggy’s help. She is *the expert* on buying in this new development. She suggested a bidding strategy that ended up saving us thousands of dollars. Furthermore, Peggy was absolutely essential to have in our corner for everything — from appliance prices to scheduling. We highly recommend Peggy for anyone looking for a dedicated and no-nonsense realtor. We are California residents who recently closed the purchase of a home on the Hamakua coast with the expert assistance of Lava Rock Realty. We couldn’t be more pleased with the help she provided us. We were simultaneously opening a new business and maintaining full time employment so time was precious as we had only a few days available for a house hunting trip. She pre-screened listings we submitted diligently to avoid wasting time. In three days, we were able to work our way through approximately sixteen different properties (we wanted to see a lot) to find one we loved. She gave great advice during the negotiation process, and stayed on the sellers like a hawk to ensure they addressed all issues promptly so the transaction closed before our interest rate cap expired. She kept us well informed at every step and is still being a wonderful resource to help us find necessary services and contractors on the island. I can’t think of anything more we could have asked of her, she is t he model of what a buyer’s agent should be. I’d also like to mention that from everything I saw, the level of professionalism that they showed us is mirrored in the other agents at Lava Rock Realty as well. We had originally contacted another agent at Lava Rock several years ago who had been willing to make time with us even though we expected it would be many years before we could purchase. Peggy, the agency owner was kind enough to introduce us when we contacted her and explained the support we’d need from a buyers agent. If seeking a real estate agent who will give you that extra measure of service, I don’t think you’ll go wrong with anyone on Peggy’s crew! Watch that other agency’s TV show, but pick Lava Rock for the personal touch! I am so happy with the service I received from Lava Rock Realty. Beverly Giza was our first choice when we decided to sell our Kohala Ranch house. She kept us informed of all open houses held and the results with comments from potential buyers. We received monthly real estate updates from her that kept us informed of the market. She was hard working, professional, honest and always worked through any obstacles with patience. Beverly was very organized and held us to task to fulfill any commitments once we had a signed contract on our house. She was a pleasure to work with and would highly recommend her as the real estate agent of choice. I’ve just completed a transaction using the services of Naome Coloma. I needed to sell my condominium in Waikoloa rather quickly and I was fortunate enough to be referred to Naome. She handled everything professionally and effectively from conducting the initial market analysis to determine a fair price all the way through to the final closing. She was able to locate a buyer within days and made every aspect of what is usually a paperwork intensive headache into a really streamlined, efficient process. Naome is punctual about returning calls and handling details and I can’t emphasize enough how happy am with her dedication to service. If I ever need a real estate professional in the future, Naome will be the first, and only person I intend to call. My previous experience with real estate agents had led me to the opinion that most do very little to earn the commission they receive. Most appear to simply list the property with the MLS and hope someone calls. Not Naome! She worked to get my condo sold by marketing it in several different ways and sell it did! She earned every penny by making the entire process fast and easy for me and I really appreciate her hard work. I would like to say how happy I was with the assistance and help from Naome and Peggy with the sale of our home in Waikoloa. Naome performed professionally through out the process and ended up to be someone we could say is not only a wonderful real estate agent but a warm and friendly person too. We were very lucky to have her and Peggy guide us the entire way. Lava Rock Realty is superb to others out there bar none. Mahalo to Naome and Peggy! Thank you for helping us move that much closer to our retirement dream. We recently sold our home in Waimea with the help of Peggy Yuan. We live in work and live overseas, and yet Peggy made the entire process run as smoothly as if we were in Waimea. She helped us find a excellent contractor to bring the house up to code and worked diligently to get the house shown once it was on the market. Peggy was in constant contact with us and once we had an offer she made the sale seamless, regardless of the fact that we were on the other side of the globe! We could not be more delighted and highly recommend her. Thanks a million Peggy! In December 2012, Bev Giza took over for my agent (who was leaving real estate) for my house in Waikoloa that I was trying to sell through a short sale. Although she was thrown into the middle of a very complicated process, that had already been going on for sometime, she handled it well, picking up speed quickly. In the days before closing, a very pressure ridden time, her professionalism in carrying out her responsibilities as my agent went above and beyond. Due to the time differences here in Hawaii, she stayed up till all hours of the night to call the mainland and send/receive emails. Her attention to all the details, responding to phone calls and keeping me abreast of everything that was happening was very reassuring. I would not hesitate to recommend her to anyone looking for a Realtor® in the future. I decided to sell my home in Hilo, and had never gone through this process before. I decided to contact Lava Rock Realty and couldn’t have been happier with this decision. They went above and beyond my expectations. Lava Rock Realty did such a great job in marketing my home, that I was able to sell my home within 4 months. I am so grateful and thankful for the wonderful service that Lava Rock Realty provided. Their diligence, professionalism and integrity is second to none and I would highly recommend them to my family and friends. You have made us feel like we are your only clients which is not an easy thing in your business and we look forward to future sales and purchases with your guidance. Thank you for your excellent service. I was impressed with your professional attitude in handling the many transactions required in the sale of a home. I appreciate the advice and guidance you both provided. We would like to thank profusely to Peggy Yuan for her outstanding work in selling our family home in North Kohala. It was difficult to part with a home that has been in our family for over 70 years. This transaction involved three families who held the house in estate. Peggy correctly assessed the market and help us to determine a good price that resulted in a relatively problem free and quick sale. Peggy was in constant communication with our family (no easy task) and correctly offered options when issues would arise. We were very impressed with her personality and professionalism. We would highly recommend Peggy to anyone to handle any sale of property. They handled the voluminous paper work with the 3 families with ease and efficiency including one that resided on Oahu. Again our grateful mahalo. To sell my house in Hawaii was a quite difficult decision to start with. The prospect of many people going to look at my house, not liking this or that, walking away again, open houses, brokers, advertisements, offers, counter offers: enough lose sleep at night. As it turned out, I was lucky to know Naome Coloma personally, she was highly recommended to me as a broker, I asked her to take the matter into her hands and everything proceeded absolutely smoothly from thereon. The first people looking at the house liked it, made an offer, accepted my counter offer, all the paperwork was handled professionally, things I did not understand were carefully explained, within a month and a half the whole transaction was completed. I cannot recommend Naome highly enough, she took all the hurdles with apparent ease- some of them quite problematic-, always quick to inform me, always friendly, a real joy to work with. I wish I had her here in Japan, right now I am looking at properties in Kyoto. In need of a broker on the Big Island: ask for Naome! She is by far the best real estate agent I have ever dealt with. Every detail was taken care of and following the purchase she has continued helping us whenever we need. She takes the initiative naturally and the result is unsurpassed customer service. We want to thank you for selling our Waikoloa Villas Condo. We were first impressed with how you handled prospects when we met you at the Open House for our friend, and later the results you had in selling his unit and his recommendation for you. Having someone we could trust to handle the selling time frame and take care of the unit in our absence were key areas as we made our decision to permanently leave the Big Island. The perfect buyer made an offer by the time we left the island and we were confident that you would keep a watchful eye on the unit until it closed. You saw that all the steps in the process went smoothly and arranged for the repairs requested by the inspector to be made in a cost effective and time efficient manner. As a result we want to recommend you to anyone who is looking for a true professional Realtor. We appreciate the time you took to explain the entire process of selling our unit. From listing the unit to escrow and finally, closing on the sale we were pleased with the process because of your attention to detail and constant communication. You really cared for us and worked hard to make sure that the transaction ran smoothly. We are looking forward to our new lives in Florida and thank you for helping us o make this happen. We live on Oahu and needed to sell my father’s property on the Big Island. A friend of ours recommended that we work with Lava Rock Realty. Not having met anyone from Lava Rock Realty in person, we were a little apprehensive. It turns out that we had nothing to worry about. From the start, Peggy Yuan eased our anxieties. The agent she appointed to assist us was always prompt, communicative, knowledgeable and courteous. She always went above and beyond for us. It really felt like we were working with an old friend. Thank you, Lava Rock Realty for making it so easy for us to sell our Fern Acres property in a short amount of time! We recently completed our home purchase with Lava Rock Realty. Being our first home purchase here on the Big Island, we wanted to be sure we worked with a realtor and agency that was experienced, knowledgeable, as well as caring & friendly. Throughout the process, we were always confident in their expertise and knowledge, but we were so glad we chose her when we saw how much she treated us and our two young boys like family! She was always so thoughtful in bringing small snacks for the boys on our “house-hunting” trips and making sure she included them in asking their opinions and views of homes we visited! We knew what kind of home we wanted and what price range we wanted to be in. It was her thoroughness and attention to detail that allowed us to skip through most of the anxiety that can come up when buying a home and focus on obtaining the home we really wanted. In the end, we bought our new home in the neighborhood and price range we wanted and we couldn’t be happier! Because of Lava Rock Realty, this has been a wonderful experience and our family absolutely LOVES our new home & neighborhood! We are all so grateful to have been able to work with Lava Rock Realty! I want to compliment Naome Coloma, and the entire team at Lava Rock Realty for their performance in the recent sale of my home at Wehilani in Waikoloa Village. To say that they were totally professional and knowledgeable with regard to the local real estate market would be an understatement. The rapid sale of my home was truly astounding in light of current market conditions. If you want extremely competent, friendly, professional service, look no further than the fine folks at Lava Rock Realty. We want to thank you for everything you did last year to make both our condo sale and home purchase in Waikoloa so pleasant. We are incredibly impressed with your knowledge, professionalism and amazing attention to detail. After just a couple of conversations with you, we had complete confidence in your ability to efficiently manage the sale and purchase of both properties. This is even more impressive because we were in Oregon during the sale, and you coordinated everything smoothly and did all you could to ensure the transaction was completed. Additionally, you did a fantastic job keeping everyone on schedule and ensuring that we received all the necessary paperwork to make our purchase as smoothly as possible. Your generosity has not stopped there! We were so impressed when just recently you set up an appointment to have a decorator come in to our home and give us ideas on what we can do to make our home exactly as we want. We are more than happy to recommend you, and we will definitely contact you for any future real estate needs. We have been working with Naome since early 2011 and she has been instrumental in assisting us to locate and purchase a home here in Waikoloa Village. During the entire process she has repeatedly demonstrated her professionalism, dedication and determination towards helping us to attain our goals. Regardless of the circumstances, we were always greeted with her bright smile and positive attitude toward the continuing search for what we were looking for. She was always available to us to answer any questions we might have. Her determined search of the market was finally successful in finding what we wanted. She guided us through the sometimes long and difficult process towards final closing and we now reside in our dream vacation home. We offer a loud and grateful “Mahalo” for all her efforts in our behalf. Dear Peggy, Thank you so much for your help with the sale of our house. We sincerely appreciate the hard work and willingness to go the extra mile that everyone put into it. Their agents were fantastic and worked very hard to take care of the many issues that we could not because we are no longer on-island. They visited the property regularly and always made sure it was ready for showing. In particular, they made several trips to the house and coordinated with the water company and our handyman to help us resolve a leak in the sprinkler system that was very hard to find. They always took the time to keep us informed and were on top of all the details during the sale. We also want to thank you for the way you run your company. We appreciate the level of trust, confidence and integrity we had in our relationships with everyone throughout the entire process. You have a great team! It was a pleasure doing business with you and we would be happy to refer people to Lava Rock. Mahalo! Just wanted to say a word about our experience with a recent land purchase in the Waikoloa area. We were on vacation in Waikoloa and found the perfect piece of property we had in mind for several years. It was close to the end of our vacation when this purchase was made. We were very happy with our service. Thank you Lava Rock Realty. This testimonial is to acknowledge the outstanding professional service I received from Lava Rock Realty. 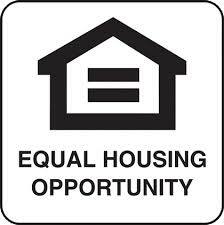 Anyone can sell Real Estate in a sellers market. However, it takes a special person, a true professional, to sell not one, but two of my homes in the past seven months. All this happened during the worst housing market in recent history. My hats off to Lava Rock Realty. Thank you so much. Thanks a lot Naome for helping us find our little place in paradise to retire to. You have done a fantastic job representing us in this deal and I will certainly pass your name around as much as possible. It’s kind of funny that I picked you’re name out of an extensive list I found on the Internet and I think we wound up with the best. I can’t believe how smoothly this deal went especially since it was a foreclosure. This is the 5th piece of real estate we have purchased and you are the first realtor we have worked with that truly worked for us. I have always felt in the past that the realtor we were working with was working more for the seller than us. So thanks again and we will have to take you out again when we return to Hawaii. We appreciate Naome’s tireless efforts on our behalf to sell our Elima Lani condo. Her availability and constant communications with us throughout the process were invaluable, as we are at such a distance on the mainland. We couldn’t have done it without her professional assistance. She did a great job for us! Beverly Giza of Lava Rock Realty acted as agents for the sale of my house in Kohala Ranch. She really went the extra mile to sell the house. She took pictures and created a website that showed the house to its best advantage. She maintained steady contact with me to keep me abreast of all the activity on the house. She assisted with all the paperwork and helped me work with the escrow company to complete the sale. In addition, helped with packing and moving things out of the house, arranging for cleaning, with taking inventory of the house and setting it up for the new owners. She answered all my questions fully and completely, and were always available to respond to my concerns. I strongly recommend Lava Rock Realty to anyone seeking real estate professionals on the Big Island. Linda & I want to thank you very much for your help in buying our home. You spent all the time necessary showing us multiple homes, so we had plenty of options. You pointed out the pros and cons as you saw them and didn’t object when we didn’t agree with you. You made sure everything was done on time, according to the contract, and finally, you helped in the fight with our bank to finally get a firm closing date. During all of this, you kept positive and an upbeat attitude. It was a pleasure to work with you and we will certainly recommend you to anyone we know who is looking for a home. I would like to commend the diligence, professionalism, and patience demonstrated to me by my realtor at Lava Rock Realty who is a remarkable asset. I wanted to sell my current home and build a new home on the beautiful parcel my late husband was brought up on. I had no idea as to where to go, who to see, or what to ask. I got a referral from a professional friend, and I now know I made the right decision. They patiently and expertly guided me through all the steps from beginning to end, and scheduled showings aggressively. The house was sold within a month. Their dedication and willingness to help in any way she can goes well beyond her call of duty. I would certainly recommend Lava Rock Realty to anyone who is planning to buy or sell a home. I would also like to thank Peggy Yuan for her help in saving me attorney’s fees during my quest to resolve a legal issue on the new property. I appreciated her tact and expertise. We are very happy with the service that Naome provided to sell our condo. Naome was very active in making sure that our condo was seen by all she spent several weekends in our condo for caravans and open houses. We were especially appreciative of Naome who offered to help inventory the condo and then ended up spending hours doing a thorough inventory by herself as I could not get away from work. Naome gave us good sound advice during the process. The purpose of this correspondence is to officially promulgate my sincerest appreciation for the efforts of Lava Rock Realty, Kamuela, Hawaii, as direct participants in the protracted real-estate process I initiated in late 2010, when I first commenced my search for a new home to purchase. Ms. Peggy Yuan, the company’s Principal Broker. I am a retired U. S. Government employee (Department of Defense), who spent the majority of his career as the Federal Transportation Officer for the Big Island, located in a Hilo office (but whose primary place of “work” was actually at Kawaihae Harbor and Pohakuloa Training Area). Following my retirement, my ex-wife and I lived for a few years in Kona, but subsequently moved back to Honolulu (where her children reside). Following our divorce in 2007, I had more or less convinced myself that I very much wanted to move away from the traffic and congestion of Oahu. I thus began a three-year review of what my options in that regard might be, as well as a careful study of the declining real-estate prices on Neighbor Islands, along with, of course, the substantial drop in mortgage interest rates. Having lived and worked on several Islands (Oahu, Kauai, and the Big Island), my areas of possible consideration were both distant and varied. After much contemplation, however, I decided, for many reasons (primarily including the fact that I had worked and lived on the Big Island longer than any other locale in my entire life), that I would begin seriously looking for a home on Hawaii Island. And, so I set out for Lava Rock Realty, accompanied by a fellow church-congregation member of mine in Honolulu (who also happened to be a former co-worker of Peggy’s). From the outset of my expressing an interest to Peggy (during that first real-estate searching trip to the Big Island in October of last year), with regard to gaining and utilizing her obvious expertise experience, she demonstrated an immediate and eager willingness to assist me. And, after much searching with Peggy’s former co-worker (who had accompanied me to the Big Island), I very surprisingly found an REO property that was shockingly pristine, and very definitely “priced right.” Even though I had always been very leery of units involved in short sales, foreclosures, and REOs, when I first entered the unit, I was stunned: it not only was beautiful, but it looked virtually new, as if no one had lived in it (despite being four years old). Even more remarkably, despite the fact that the seventeen units which comprise the low-density/high-end complex known as Paniolo Gardens sold for prices close to $500,000 a mere four years ago, this REO unit was listed at roughly a third of that cost. I was instantaneously enraptured by the place. I immediately wanted to make an offer on it, and returned to Honolulu, full of optimism about making a deal work. At that point in time, I had NO IDEA of the horrors that were awaiting me. What ensued over the course of the following several weeks and months is a litany of agonizing, repeated, excruciating (for me) events, nearly all of which involved my experiencing massive disappointments, involving such issues as failed “exotic-financing” options; unavailability of mortgage-loan approvals; and even such absurd rarities as switching of escrow officers in mid-stream, coupled with concomitant escrow delays and confusion. It is no exaggeration for me to state that on numerous occasions, I was actually thinking I needed to forget about Paniolo Gardens entirely, and simply move on to other considerations (including looking for a home on Kauai, or even on Maui [where I had never even lived]). It was during this time frame that it became obvious to me – as well as to my Honolulu realtor friend and to Peggy – that if I were to seriously consider continuing to pursue the Paniolo Gardens purchase, then I would positively need constant, on-site assistance from Lava Rock. Thus, a mutual decision (a very friendly one, I might add) was consummated, whereby my Honolulu realtor friend bowed out, and Lava Rock agent became my full-time representative. I would likely be less than exaggerating if I were to state that those agonies that I had previously endured – in trying to make this purchase come to fruition – were minimal, compared to those which I had to suffer in the following several weeks. Even after we had FINALLY managed to get an offer accepted by the REO bank, several incredible delays and problems further resulted with the escrow process itself. As much misery I, myself, felt I was enduring, I actually had compassion for my agent, who was tasked not only with the responsibilities of coordinating all of the seemingly-daily changes and updated revisions with the loan and escrow officers, but who also had to “baby-sit” me, trying to keep my confidence level up, and my optimism intact. The coup de grace occurred, when I finally left Honolulu, and relocated over to the Big Island physically (at the end of December), expecting to close on my Paniolo Gardens unit on 3 January. Once again, I found ourselves mired in ongoing escrow and loan difficulties, which protracted the closing – and my ability to move into my place! – week after week after week. Again, my agent had to suffer the pains of helping me find not only temporary housing (I was literally gypsy-like, in my roving from locale to locale), but even such mundane issues as where I could do my laundry. And Peggy had to endure my frequent visitations to her office, where I regularly went to “mooch-off” of her Internet access: yet all the while she continued assuring and re-assuring me that she was more than happy to see me. I am certain my agent must have wished many times that he had never met Bill Nordstrom, and Peggy was probably sensing the same types of emotions! Nonetheless, through it all, my agent remained (as did Peggy) 100% supportive of me, and 100% committed to our ultimately completing the successful process. And, complete it we did. I finally (FINALLY!) moved into my new home on 1 February, and I could not possibly be happier. The fact that the deal ultimately, finally came together is, in large measure, a significant testimonial to the steadfastness of Peggy’s insistence that we never “lose the faith.” They were the primary means of support for me, during my emotional roller coaster of hopes; then repeated disappointments/frustrations; and, finally, great joy. In conclusion, I emphasize that Peggy is the personification of a real-estate-broker professional. Vis-à-vis her “Can-Do Attitude,” she keeps the satisfaction of her clients at the forefront of her mission, and works tirelessly to achieve that goal. And, beyond any doubt, my agent is the CONSUMMATE AGENT. He is tirelessly energetic; he is unfailingly committed and dedicated; he is positive and optimistic in the face of all adversity; and he is clearly deserving of recognition, and much praise/commendation. Even more importantly, he has become my close, personal friend. I extend to Peggy my heartfelt “Mahalo Nui Loa,” for a JOB EXTREMELY WELL DONE. Thank you so much for making this sale happen. I was worried being 4,000 miles away, but you handled everything perfectly for sale of my Paauilo home. You are awesome and deserve an award for best Realtor!!! We are so grateful for you. You found us this house that met all our expectations. You answered all emails, text messages and phone calls when we needed you. You made us feel as we were the only ones that mattered. Even with the obstacles we went through with the bank, you fought for us hard. You were there until the very end. Thank you so very much. Miracles happen. Thank you for your dedication in helping the locals of our Island. And we also thank God. Purchasing a home is a big step and can be an anxious experience, especially when the home is on another island. Working with Lava Rock Realty made the transaction easy; she is accommodating, timely, resourceful and will always goes the extra mile. Their ability to “anticipate” always kept us ahead of the game. Their credibility and integrity allowed me to put my trust in them with the end result that I was seeking. I now own a Big Island Home! Thank you for all of your insight, hard work and generosity! We felt safe in your hands throughout the whole process and knew that you were taking good care of us. We are absolutely thrilled that we bought our new homes at such a remarkable price and closed so quickly! We must say, you are honest and genuine, and that you continue to check in on our well-being says it all. Dear Naome, Thank God for answered prayers, we’re done, pressure is off and we succeeded. Before we came to know you we were so stressed out because our property manager who later became our agent to market our 2 properties totally failed us. Both houses were neglected and poorly maintained. Letty and I thank God for answering our prayers by introducing you to us through your mailings and what a big difference that made. You are so motivated and you take great pride in what you are doing. I heard it said “the difference between ordinary and extra ordinary is that little ‘extra’ “. You displayed that “extra”- that energy, that pride, that commitment when you took over in selling our 2 houses in Waikoloa which both sold much faster than we thought possible considering that the health of the U S housing market is in coma in ICU. We pray that God will bless you with good health and more success so you can continue to extend that wonderful service to others much like you did for us. Thank you again. You have our respect and love. Over six months ago, I came to the Big Island on a working assignment at the Waikoloa Beach Marriott. After a while it became apparent that the temporary assignment would become more lasting. During the transition, it became necessary to rent an apartment while a permanent residence was sought. In the process, I was fortunate to have been directed to Beverly Giza, (Realtor) of Lava Rock Realty based in Waimea, Hawaii. As a homeowner on Oahu for 21 years and not being familiar with the housing market on the Big Island, it was great to have Beverly assisting with house hunting, which is a very stressful and emotional process. For a change, our family wanted to live in a neighborhood that was quaint and not tethered with the restraints of urban living. We sought a place in the “countryside” that would provide a sense of home and a feel of Hawaii from simpler times. On my days off, Beverly would line up numerous homes for our family to view. Beverly was very knowledgeable about the areas and property values. She was well prepared with real estate information and patiently explained all of the nuances and idiosyncrasies of life on the Big Island. Between viewings, I was also traveling between Oahu and the Big Island preparing to sell my home on Oahu. Beverly would tirelessly search the listings for homes she felt were suitable for our lifestyle and budget. All throughout this time, I never felt rushed or pressured to “buy now.” She would listen to our concerns and our family would carefully consider her suggestions. Once during a particular viewing, my daughter came down with a severe allergic reaction. Beverly took us to her home and provided medication to alleviate the symptoms until we could take our daughter to the ER. It was reassuring to know that Beverly genuinely cared about our interests and well being. Finally after many months of searching and viewing, Beverly helped us locate a home in Hawi, on the north side of the Island. It was a well kept mature home in a secure and pleasant neighborhood, with an unbelievable view of the ocean and Maui. In closing, I would not hesitate and highly recommend Beverly Giza to anyone interested in purchasing (or selling) a piece of paradise on the Big Island. She is a true professional and very personable. She keeps the interests of her clients at heart and conducts her profession with a passion. Thanks for a thorough job in completing your promise to sell our home in Puu Nani. Your creativity, persistence, advice and follow through were determining factors in our success. You kept your word and your commitments throughout. I’ve been 25 years in the business and you are at the top of your profession in my opinion. It makes me proud to tell all I meet what a great job you did. We send you our Aloha and appreciation for your exceptional service. Holiday season is coming up now! We are happy we will be able to celebrate Christmas with no stress. We were also very very appreciated your support. We are sure if our agent were not you, we were still in suffer from selling home. 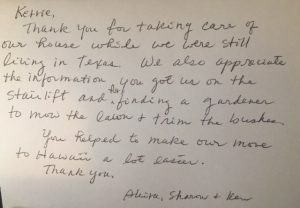 We were surprised that you helped to clean a house, none of agents did before! There were deep warm hearts in this company not only baseness! Mahalo nui loa Again! Sincere and hardworking Lava Rock Realty was instrumental in the sale of my dad’s property. They persevered through all the market obstacles all the while sensitive to our situation. They are very knowledgeable with the Big Island market especially Waimea. I would highly recommend Lava Rock Realty. I was recently faced with the challenge of finding a new place to live. It seemed like a very daunting task. But then I had the unbelievably good fortune of finding Lava Rock Realty. Their kindness and caring manner coupled with their knowledge, professionalism and integrity throughout the buying process helped me immensely. With their assistance and guidance, I was able to find a new home, negotiate a fair price and close on it in record time. Now, I love my new home. I would highly recommend them to anyone in the real estate market whether buying or selling. I’m confident you won’t find a better agent on the Big Island! Bev did a great job! The market was stagnant as we couldn’t even get an offer for almost 2 years until we listed the house under Lava Rock. I did not have great expectations of selling the house but Bev got us a couple of offers. Next thing you know, we’re closing! All the while, they kept a positive attitude and assured me that we would sell it. They are very professional and personable. I would refer them to anyone that wants to sell their house and sell it fast! I appreciate their efforts! Lava Rock Realty has been the most effective and personable group of real estate experts that I have found on the Big Island of Hawaii. I can’t thank them enough for their great work and representation in selling my condo in Puako. Yesterday we took the ferry to Lanai to snorkel and while going over, I turned to my husband John and said “I love living here.” It’s beyond my most wonderful dream. Thanks to you, for never letting us forget about the dream. Naome, I want to thank you both for the attentive and professional service you provided us in finding our home. Not only were you both very receptive to all our last minute requests and never ending phone calls, but you had so much patience with our children as well who tagged along on almost every home viewing. Your open availability, email updates as new homes hit the market, and informed guidance made the house hunting process so much more pleasurable than expected. Mahalo Nui Loa for helping the Jensen Family find a beautiful home in our price range! Naome… I just wanted to thank you for all your valuable knowledge and expertise in helping me and my wife find the “home of our dreams”. Your professionalism and dedication has made our transition from “renters” to “homeowners” an easy switch. Lava Rock Realty has a priceless asset with you as a Realtor and I know that your future ventures go as smooth as ours did. Good luck with everything and Thank you again for all of your assistance. “The service provided by Lava Rock Realty was thorough in every way from start to finish and beyond. Thank you Lava Rock Realty for your dedicated staff and associated businesses who team up to bring us to a new chapter in our lives. Lava Rock Realty helped us buy a house in Kamuela. They persistent and creative in finding ways to resolve issues with the seller. With professional advice and guidance, they supported our decisions throughout the negotiation process. they were attentive to our whims and answered all our questions patiently and thoroughly. We felt very comfortable working with Lava Rock and definitely recommend them as a real estate firm to go to. We thank Lava Rock Realty for their hard work and dedication. We also thank in particular Peggy Yuan for her continuous support. We heartily recommend Bev Giza as a real estate agent on the Big Island. Bev helped us price and sell our house in 12 days in a particularly tough market. She knew how to market it, make it look attractive, and solicit the offers. Once we received the offer, she was very helpful to us in the negotiation process. Bev was always available by phone for discussion and advice and kept us up-to-the-minute as the process unfolded. We never felt ignored or uninformed, as can happen so often in a long-distance real estate transaction. Since we were not on the island, Bev managed all vendors and inspections, always keeping our best interest in mind. She is a true professional, with the attention to detail so critical in a real estate agent. To Bev Giza: Thank you so much for everything you did to help us get a piece of “The Rock.” You have been wonderful from the start of this adventure. We truly appreciate all your time and hard work – you went above and boyond the call of duty! When I first contacted you from Texas, little did I know that you would be the one to help make our dream possible. I know it was tedious, and problematic completeing this transaction with us in Texas and the Sellers off the Island, but you were a trooper and accomplished everything including looking out for our best interests. Thank you again from the bottom of our hearts. Excellent work in handling the Molokai transaction. Received the delicious Big Island cookies. Mahalo! I can’t thank you enough for all you’ve done for Mark and I.. You never lost hope!.. I can’t believe all is done. We are now HOME OWNERS much thanks to you… You weren’t only our Realtor you became our friend, one that will be in our lives for a very long time. We’ll be sure to invite you to any up-coming functions. Whether it may be our house warming party, wedding or our future baby’s birthday. Well we can’t thank you enough! Thank you for everything and your positive attitude throughout the whole house selling process. Thanks for tying up all the loose ends and getting the deal done.